The Southern Hotel was located in Newhall at the southwest corner of Railroad Avenue and Market Street from 1878 until Oct. 23, 1888, when it burned down. It may be noted that unlike the artist's rendering published in 1880, this 1886 view does not show a flag flying above the cupola or a sign for "D.W. Fields & Co." at the corner. In a photo caption in The Signal newspaper of January 2, 1947, historian A.B. Perkins identifies the people on the piazza as follows: Mr. and Mrs. J.O. Newhall (J.O. was the last operator of the hotel and cousin to Henry Mayo Newhall); W.E. Hays, assistant manager of the hotel and store; Miss Terry, the future Mrs. W.E. Hayes; John Arndt, superintendent of the Newhall Ranch; John Murphy, company store clerk; Julius Matter, hotel clerk; Joe Leighton, Pico Canyon rancher; and a Mr. and Mrs. Brown, guests from the East. According to Perkins (ibid. ), the photograph was made in 1886 and "reproduced through the courtesy of Mrs. W.E. Hayes" (Miss Terry in the photo). 2014 Update: We now know from news reports when the Southern Hotel burned down — and not only the year and date but also the time. The fire erupted at 8:15 a.m. on a Tuesday morning, Oct. 23, 1888, and the hotel was gone by 9 a.m. The fire started in the dining room when someone lit the fireplace for the first time that season. The blaze was blamed on a defective flue. The livery stables out back of the hotel also was razed; there was speculation that had it been drier and windier, all of Newhall might have gone up in flames. As it was, the SPRR Newhall Depot caught fire but didn't burn down thanks to the Pacific Coast Oil Co.'s firemen. The recent (2014) discovery of news reports from 1888 render much of the following discussion obsolete. 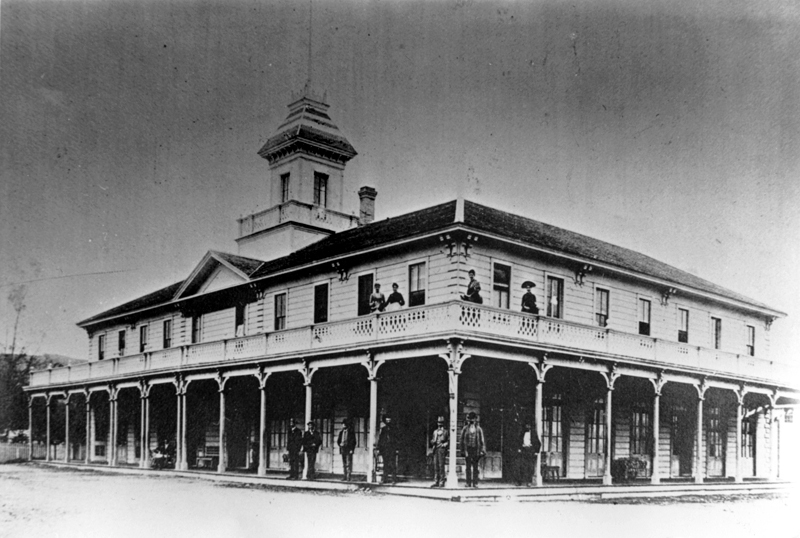 The Southern Hotel, located at the southwest corner of Market Street and Railroad Avenue in Newhall, was known as the finest hotel south of San Francisco. It was a large, wooden, two-story, L-shaped Victorian building with a shaded ground-floor porch and a railed second-story veranda, topped by a cupola with a widow's walk. Historians A.B. Perkins and Jerry Reynolds favored 1878 for the hotel's construction. Perkins liked 1887 and Reynolds used 1888 for its destruction. We have few visual clues. Only four photographs (or five, depending on how you count them) and one artist's rendering are known. One photograph is a close-up of the hotel. The second is a long-distance town view dating between 1879 (when the first Newhall School was erected) and 1890 (when the school burned down). The third is actually a set of two photographs that were shot from the same vantage point to form a panoramic view of Newhall. It dates no earlier than 1879 (the school is visible), and probably closer to 1887, since J.O. Newhall's general store can be seen (see below). The fourth (or fifth) photo shows a horse-drawn wagon and driver parked in front of the Southern Hotel, but only corner of the porch is visible. The artist's rendering (unknown media), originally published in black and white in Thompson and West's "Los Angeles County, California, With Illustrations" (Oakland, 1880) shows the structure topped by a flag bearing the words, "Southern Hotel," with a sign reading "D.W. Fields & Co." on the second-story railing at the main corner of the building. Also, the 1889 plat map of Newhall shows an L-shaped space at this location, marked "HOTEL" and spanning two and a half parcels. Crofutt's Guide. As the new railroads made the West more accessible, travel guides came into vogue. One such was "Crofutt's New Overland Tourist and Pacific Coast Guide." Published in 1880, the listing for Newhall (pg. 235) includes the following: "The Southern Hotel with accommodations for 150 guests, a beautiful park, and a planted grove of trees are among the late improvements." Of interest, too, is that the author of this section of the guide said he passed through Ravenna and Lang in January 1878. Traveling south to Newhall, it can be presumed he reached the latter town around the same time. Pen Pictures. One of the nearest things we have to a primary source is the Los Angeles County edition of "Pen Pictures from the Garden of the World" from 1889. "Pen Pictures" is hardly a scholarly work; in an era when travel guides were popular and sprouting boom towns vied for attention, a vanity book publisher from Chicago traveled the country compiling and selling massive, leather-bound city and regional anthologies. The modern reader would suppose that J.O. 's biography in "Pen Pictures" is what we would now call "advertorial" copy — editorial copy provided and paid for by an advertiser, in this case J.O. Newhall, who was still an active town merchant. But "Pen Pictures" goes to lengths to say it isn't advertorial copy. "The historical material in the biographical sketches were obtained with great difficulty," the publisher states, "and therefore none of that matter is supposed to be dictated by those interviewed, for the purpose of advertising themselves or their business." Whether provided directly by J.O. Newhall or through an interview, it can be inferred that the infomation in J.O. 's "biographical sketch" came from the subject himself. J.O. Newhall's entry in "Pen Pictures" says: "In 1887 (J.O.) opened the hotel in Newhall, which burned down October 23 of the same year." 1887 is not a viable construction date. The biggest problem with it is the 1880 artwork. The same artist's renderings of other Los Angeles-area developments were published in the same 1880 book, so the artist's rendering of the hotel in (or before) 1880 wasn't a flight of fancy. We must accept that it existed by 1880. A second problem is the listing in Crofutt's Guide of 1880, referenced above. Moreover, J.O. didn't build or "open" the hotel. It's possible that 1887 marked J.O. 's arrival — although that seems too late, considering brother/cousin Henry died in 1882 — and that the hotel burned down the same year. Rolle seems to agree on the latter point. Andrew Rolle. Henry Mayo Newhall biographer Andrew Rolle is considered an authority on the town founder. The Cleland Professor of Emeritus of History at Occidental College and Research Scholar at the Huntington Library, Rolle relies heavily on primary source documents in his book, "Henry Mayo Newhall and His Times: A California Legacy," published by the Huntington in 1991. Rolle writes (pg. 96): "South of the Derrick Saloon, at the corner of Main [as Railroad Avenue was known at the time, Rolle notes] and Market streets, Henry [M. Newhall] opened the Southern Hotel in February of 1878. It was considered the finest hostelry between Los Angeles and San Francisco. He appointed D.W. Fields its manager. Flanking the hotel were carriage sheds, livery stables, corrals and a park [Rolle notes the 1880 artwork]. Staffed with Chinese, the Southern became a new center of social life for the community, with miners, oil workers, and stockmen coming together there on Saturday nights. Newhall's ranch hands, housed in tents outside town, gathered there on weekends for its dances or to use the hotel's spacious reading room." Rolle continues (pg. 99): "J.O. Newhall, an Eastern cousin [of Henry], opened a second general store across from the Southern Hotel that was financed by the town's founder," and on pg. 101, "By 1887, fire destroyed the Southern Hotel, which was never rebuilt." Unfortunately, besides the 1880 artwork, Rolle cites no sources for his Southern Hotel information — which appears amid descriptions of other Newhall townsite features where Rolle sources a 1958 Perkins story published in the Historical Society of Southern California Quarterly. So clearly, Rolle was reading Perkins when he wrote about the Southern Hotel. Rolle commits an "internal error" with the Southern Hotel's construction date. His text says February 1878, but his photo caption on page 98 says 1877 — which isn't possible, for the same reason Newhall School wasn't built in 1876. In his 1962 story, "The Pico Ghost Camp," local historian A.B. Perkins relates that the Southern Hotel burned down in 1887. Perkins labeled a copy of the main Southern Hotel photo to identify the locations of the dining room, ladies' parlor and gentlemen's bar, the latter run by D.W. Boynton. There was also a reading room. Reynolds discusses the decision of Jan. 15, 1878, to relocate Newhall from Bouquet Junction, and the completion of the move one month later. He writes: "Later that year Henry Mayo Newhall began construction of his Southern Hotel at what is now San Fernando Road and Market Street. [...] A boardwalk led patrons from the much-expanded depot through formal gardens, past a gushing water fountain of classical design, to the wide veranda. Inside were found a shop, a well-furnished reading room, a restaurant and D.W. Boynton's 'Genteel Bar.' Panelled bedrooms were located upstairs. Here a gentle traveler could rest and refresh himself while awaiting the next stage to Ventura or Santa Barbara." Reynolds listed October 1, 1888, as the date of the fire in both his 1992 book ("Santa Clarita: Valley of the Golden Dream") and in an earlier manuscript. He doesn't cite a source. Vernette Snyder Ripley, in her exhaustive study of the Newhall Pass — published in multiple parts in 1948 by the Historical Society of Southern California — writes that in the late 1870s, Henry M. Newhall "had started to build a large hotel, the Southern, with a cupola and fancy railing topping its 150 rooms. It had a spacious porch around it that faced 'a beautiful park' for its guests to stroll in with a fountain in the middle. About it was a newly 'planted grove of trees.' The large stables were evidently for the harboring of the horses and stage coaches that used Newhall as their starting point." Ripley cites two sources: the 1880 artwork; and Crofutt's Guide, 1882 edition. Ruth Newhall, in her 1992 book, "A California Legend: The Newhall Land and Farming Company" — a revision and expansion of her seminal 1958 work, "The Newhall Ranch" — provides a brief discussion of the hotel. Without assigning a date or noting the town's 1878 relocation, Newhall (Henry's great-granddaughter by marriage) writes that the town founder "reserved two central square blocks for himself. He envisioned the town as a major southern metropolis. In the name of his ranch superintendent D.W. Fields, he incorporated a hotel company and, on one of the main blocks, built a hotel [...]. Across the street from the hotel, [Henry] Newhall laid out a town square, planted it with young trees, and daily during the hot months sent up a water wagon from the river to irrigate the park." Ruth Newhall reproduces the 1880 artwork in her book and identifies it as an 1880 print of an 1878 view. Over the Range to the Golden Gate was an oft-published travel guide that first appeared in 1884 and describes the towns along the rail route from Denver to San Diego and thence to Seattle. The 1896 edition includes this entry for Newhall: "This (train) station is not very large, but boasts a large hotel, capable of entertaining one hundred and fifty guests. [...]" Other incongruities in "Over the Range" lead us to believe the hotel information originated in the 1884 edition and was not updated in 1896 to reflect the hotel's destruction. It's unlikely that the second Southern Hotel, which stood in 1896, accommodated 150 guests.